Southeastern Colorado is a region of contrasts -- from the heights of the Sangre de Cristos to the plains of Baca County. From ski areas to cattle ranches, from mines to manufacturing – all can be found in southern Colorado. Pueblo, the largest city in the region, is home to Southern Colorado Community Foundation. You, too, can become a member of the Circle of 100 at Southern Colorado Community Foundation and help decide who to support in Southern Colorado. Discover how to donate today. 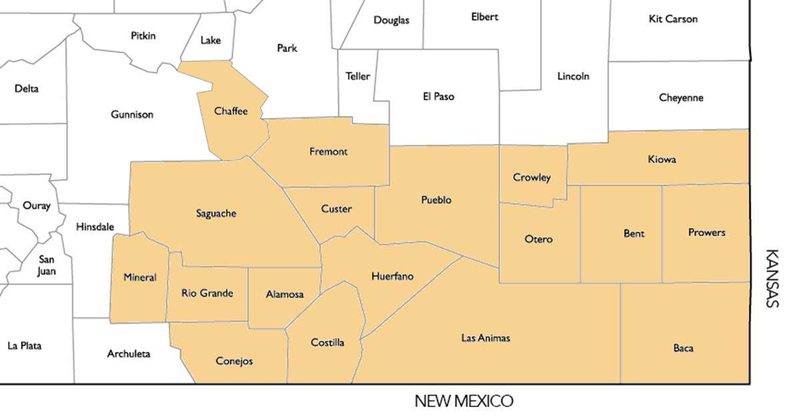 Working to benefit Alamosa, Baca, Bent, Chaffee, Conejos, Costilla, Crowley, Custer, Fremont, Huerfano, Kiowa, Las Animas, Mineral, Otero, Prowers, Pueblo, Rio Grande, and Saguache counties.